If I consider some of the fantastic things I’ve done in 2014 so far, I’m overwhelmed with appreciation for the welcoming little country that I now call home. One balmy evening, when the winds of February swept casually over the white sands of Playas del Coco, I took my son out for an unforgettable few hours of sailing. The owner of the vessel was a recent acquaintance, and offered a sunset cruise in exchange for a piece of furniture I was selling. So, my “first mate” and I spent the long afternoon feeling the breeze and the warm, ebbing sunlight while sipping on juice—well, technically, sangria for me. We got a close look at rocky coastal islands…we chased a trail of pelicans in the sky…and we got a real surprise from Mother Nature. In the flash of a moment, our sailboat was encircled by a fleet of dolphins! I’ll never forget how brightly my son’s eyes glowed while watching the playful team leap into the air around us. It was pure magic. In Costa Rica, we have many opportunities like this to inhale the beauty of nature, whenever the urge strikes us. One Saturday a few weeks ago, for example, we decided to go hunting for waterfalls. We wound through the peaceful Central Valley towns of Grecia, Sarchí, and finally to San Ramon, where we’d heard about a waterfall park. We followed signs upon entering San Ramon to “Las Musas,” which means “The Muses.” It turned out to be a stunning public park that contains five waterfalls, a playground, restaurant, and even a pool with a thrilling water slide. For just $14, our whole family enjoyed the property all to ourselves that morning. 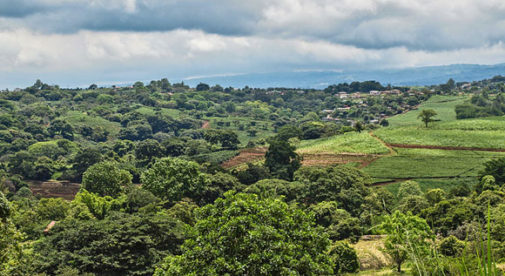 Costa Rica offers expats many opportunities to enjoy the stunning natural beauty of this small Central American country. And the best part about living in such a beautiful environment is that we can quite comfortably afford to enjoy it. We’ve just signed a lease on a lovely home for the next year that meets all of our wishes and only costs $455 per month. On a private, gated property, sits our three-bedroom, three-bathroom, American-standard home. We will even have a spacious office to work and write from, and an outdoor rancho to entertain friends in the midst of many organic fruit trees. When I think about the life we’ve created for ourselves, I can’t help but send thanks to our adoptive country. 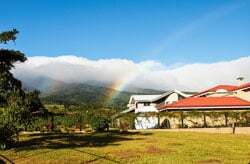 Costa Rica is a place that has welcomed us with goodwill and generosity, and happily invited us to explore the lush and mesmerizing nature within its walls. With a loveliness that never dulls, it has convinced us to stay rather than live anywhere else. And when I visit the States every year, I ache to return to my wonderful new world.